What happened to Iraq’s ‘human shields’? 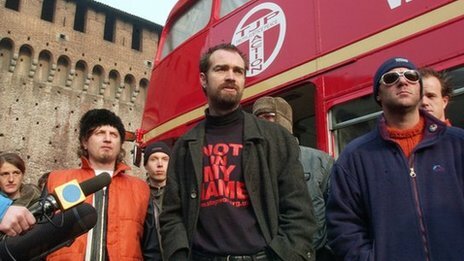 In March 2003, a group of international activists staged one of the most high-profile protests against the invasion of Iraq. With the world’s media watching, they drove in a ramshackle convoy of buses to a power station near Baghdad. Mr Letts had driven from Big Ben in London all the way to Baghdad, picking up “human shields” – peace campaigners from about 35 different countries – along the way. They had arrived on three buses – two of them red London Routemasters owned by Mr Letts and usually hired out at West Country music festivals. On the three-week journey from northern Europe, the activists had braved steep mountain roads and treacherous snowstorms while cooped up inside the cramped double-deckers in sleeping bags. Saddam Hussein’s regime welcomed the human shields with open arms when they reached Baghdad on 15 February, timing their arrival to coincide with huge anti-war demonstrations around the world. They were put up in comfortable hotel suites in the centre of the Iraqi capital. The activists were planning to fan out to key sites around Baghdad, taking state-of-the-art cameras, satellite phones and computers with them. But as soon as the campaigners had settled in, the Iraqis announced that they had different ideas about how the operation would work. Many in the group were expecting to be deployed to sites such as hospitals and schools, but their Iraqi liaison officer, Abdul al-Ashhemi, said Saddam Hussein’s regime wanted them to defend six key infrastructure sites instead. The sites included an oil refinery, a power station and a food depot, where, Mr Ashhemi announced, the shields would be given special Westernised accommodation – including proper toilets. The meeting was fraught – some of the activists were shocked, feeling they had travelled thousands of miles to save lives, not to protect Iraqi industry. Mr Letts admits there was “dissent in the ranks”, but he spoke in favour of the Iraqi plan and eventually carried the day. As a former disaster relief worker who had been to Iraq in 1991, he says he could see the sense in keeping Baghdad’s power and electricity going after the bombing. And he accepted, too, that these – and not schools and hospitals – were the sites that had actually been targeted during the first Gulf War. “When we eventually turned up at Baghdad South power station, it had four big towers and a large picture of Saddam Hussein,” Mr Letts says. The group painted “Human Shields” in huge letters on the roof of the power station and settled in. But in the following days there were tensions within the group – and with their hosts. The Iraqis expelled one of the more militant activists – a former US marine called Ken O’Keefe – and several others. Mr Letts says Mr O’Keefe had “a passionate heart” but was a “divisive leader” and too confrontational with the Iraqis. By the start of US bombing on 20 March, others had left too – either because they were unhappy about the choice of sites or simply because they wanted to go home. After spending a week at the electricity plant, Mr Letts also left. He felt he needed to protect his buses – they were, after all, his livelihood. “My buses are all we had in the world and they were there in the middle of a war zone,” he says. Estimates of how many human shields stayed in Iraq throughout the bombing vary from 25 to just above 100. None of their sites were hit and Mr Letts thinks they did made a difference. He returned to Baghdad later in 2003 and visited the electricity plant, where the manager told him the shields had protected the site until a wave of looting broke out immediately after the US-led invasion. At that stage, the power station was still working and Mr Letts understands that there was a “broadly similar experience” at the other five installations. The human shields did not even come close to stopping the war in Iraq, but Mr Letts says it was a “massive achievement” to help keep enough of the infrastructure going for Baghdad to be “survivable”. Mr Letts says members of the RAF and other sources have told him the human shields were very much a talking point in the high command. “The Brits and Americans were very much worried about wiping out large numbers of them,” he says. The human shields were widely criticised in the West for being pawns of the Iraqi regime. Mr Letts says they discussed all their key decisions at length with Iraqi officials and then took a democratic vote among themselves. And for the Dorset bus driver, the trip to Iraq turned out to be as much of a personal odyssey as a political one. He had been struggling for years to share the Christian faith of his wife, Thea, and on the way to Iraq he was inspired by seeing the biblical sites visited by Saint Paul. Simon Watts interviewed Joe Letts for the BBC World Service programme Witness. Listen back via BBC iPlayer or browse the Outlook podcast archive.